Spring is one of Miffy’s favourite times of year; the flowers bloom, the birds sing and Easter is just around the corner! 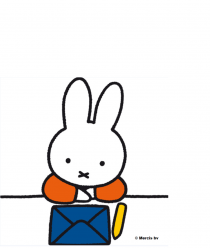 Miffy has some gift ideas which make a nice alternative to chocolate! The most luxurious Easter bunny of them all, the Miffy Velvet and Corduroy soft toys are available in a beautiful range of colours, including some gorgeous greens and yellows as well as pastels, perfect for spring. Starting at £15.99, find the velvet collection HERE, and the corduroy collection HERE. For little ones who aren’t quite ready for chocolate, the Mint Miffy Baby range makes a thoughtful alternative. The booties are perfect for keeping tiny toes toasty and each features the sweet little bunny. Starting at £9.99, find the Miffy Mint range HERE. Learn about growing vegetables with Miffy this Easter. From seed to supper, Miffy nurtures her vegetable garden to grow the most delicious carrots! Find ‘miffy’s garden’ HERE, only £4.99. There is a whole range of Miffy products which can be personalised! Add your loved one’s name for an extra thoughtful gift this Easter. The range includes stationery, homewares and more. Find the personalised Miffy range HERE.